1/48 scale waterslide decal markings. Be sure to read the notes below on using DEKL'S. 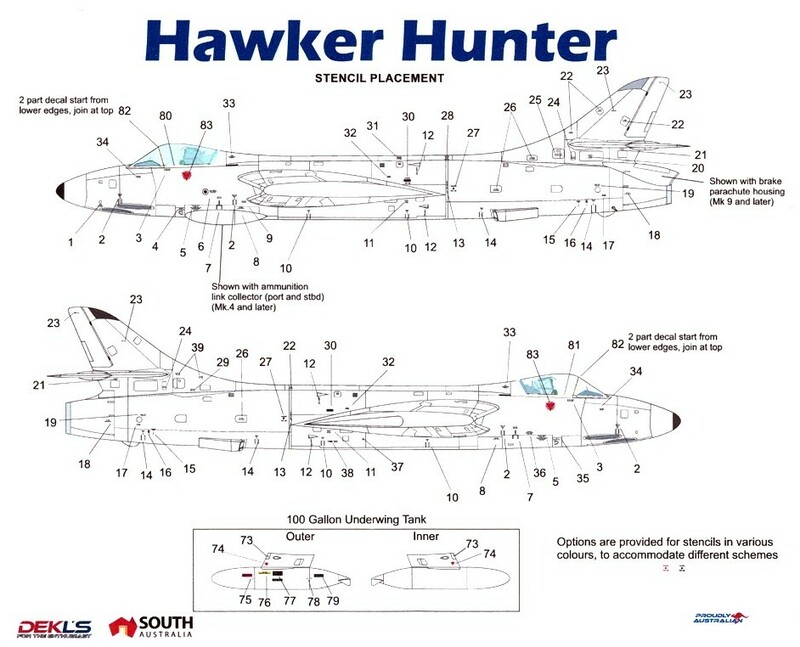 Stencil Data suitable for any 1/48 Hawker Hunter (Academy). It is intended for use with kits, or other decal manufacturers sheets, that do not provide extensive stencil data. 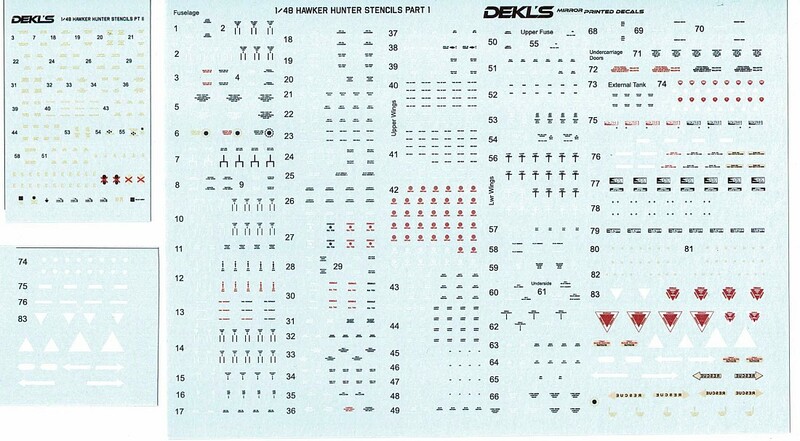 DEKL'S are very limited run of "boutique" decals produced to fill the gaps in your model collection that the Big Name decal producers of the world are unlikely to release. Be aware that once a design has been released for purchase, DEKL'S will move onto the next subject. DEKL'S is a part time only concern and it is unlikely that previous designs will be re-issued once a new design is underway. These are Laser print decals on continuous carrier film. Each individual design needs to cut out of the sheet. They are a little different from boutique decals you may have used before as the decals are printed in 'reverse'. i.e. you apply them like dry rub decals...though these are definitely water-slide decals...no need to rub them on!!! This has no impact on the accuracy of the decal - it just simply requires a slight change to your application method. 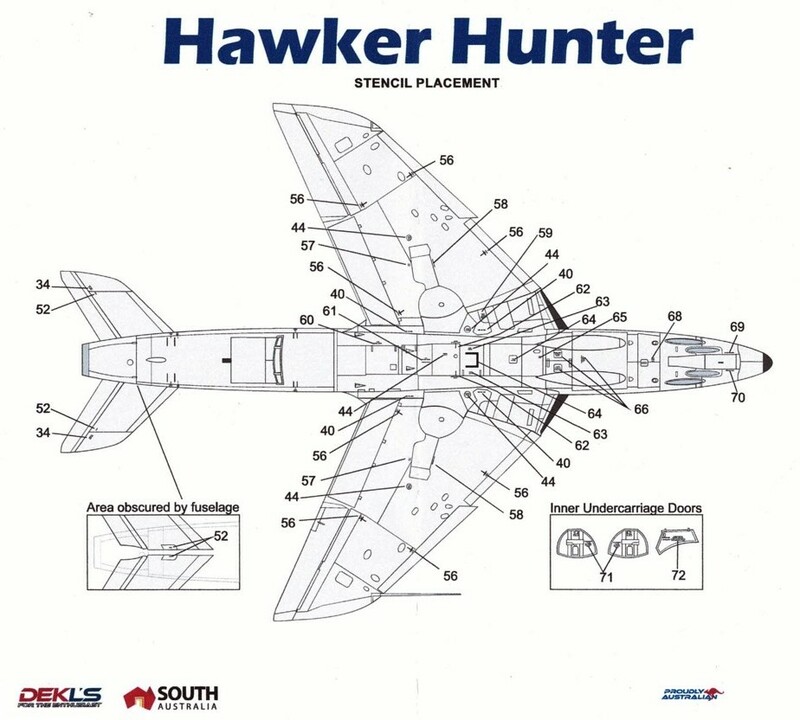 PLEASE READ THE DECAL APPLICATION INSTRUCTIONS SUPPLIED. Some designs are supplied with additional 'whites' (for backing) should the modeller wish to use them. 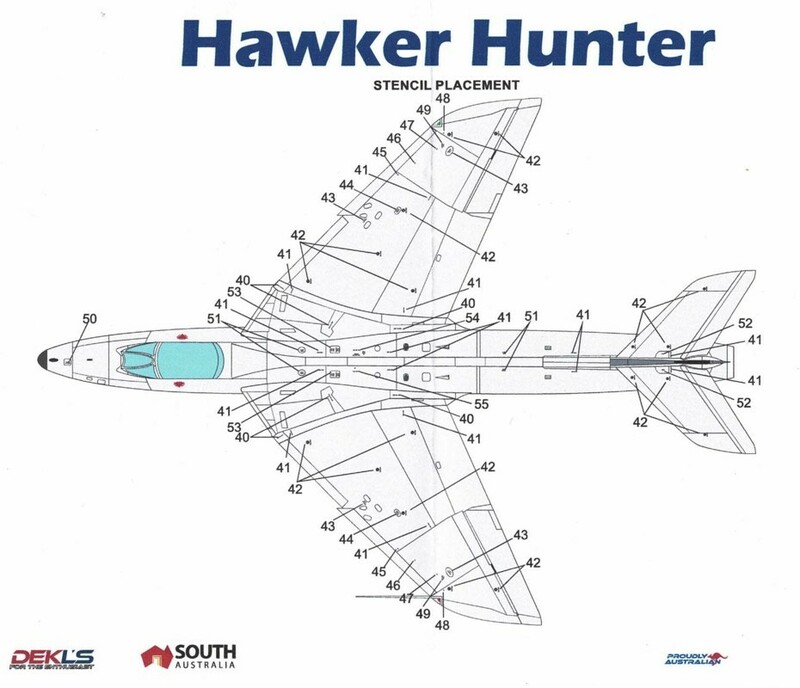 Keep in mind that these Decals and the instruction drawings are not intended as a technical or historical document of the aircraft type. They are produced within practical and economic limitations. Advanced modellers may have access to other references or have differing opinions on the depicted subjects. Please keep in mind that the market for this genre of decals is VERY small.